It seems as though I talk about tire safety all of the time. The reason I do is because tires are an important safety topic concerning RVers that are often times overlooked. Just recently I read a newspaper article that summed up just how overlooked tires, in general, are. The article stated, “The Rubber Manufacturers Association found that 29 million drivers believe that tires require no regular maintenance.” This number might be considered small when compared to our current deficit, but it is quite large when you consider 29 million people are driving around the country on tires they don’t know the condition of. With peak travel season quickly approaching I thought it would be a good time to offer some tire tips for safer trips. These tire tips apply to your automobile as well. 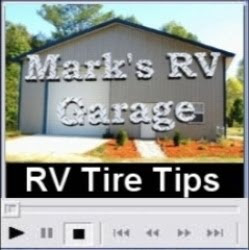 Two of the biggest problems with RVs today are overloading the RV and under inflated tires. With multiple slide-out rooms, large holding tank capacities and the ample amount of storage space available on today’s RVs it’s easy to see why so many are overloaded. We have a natural tendency to fill every nook and cranny of available storage space on our RVs. Another problem is out of balance loads. You can be within an axle or tire’s load capacity on one end of an axle, and be over capacity on the other axle end. This is a common problem with RVs and many times the cause is poor weight distribution and/or improper loading of the RV. When this happens the tire or tires on the end of the axle that is overloaded are subject to tire failure. The bottom line is overloaded RVs and under inflated tires can be extremely dangerous. The only way to make sure that your RV is not overloaded is to have it weighed. Weight ratings for RV’s are established by the manufacturer and are based on the weakest link in the chain. When you exceed a weight rating you are overloading one or more components on the RV and risk wearing the component out prematurely or complete failure of the component. In many cases the tires on your RV are the weakest link. Just like the axles on your RV, your tires have load ratings too. The maximum ratings are molded into the side of the tires. Keep in mind these are maximum ratings. The sidewall of the tire shows the maximum load and the inflation pressure for that load. Never set the inflation pressures below the recommendations you find on the vehicle manufacturers placard and do not exceed the maximum inflation pressure ratings found on the tires sidewall. The tires on your RV are the most vulnerable component affected by overloading the RV. There are numerous reasons for this. First and foremost is when the tires are not inflated properly for the load. Failure to maintain correct tire pressure can result in fast tread wear, uneven wear, poor handling, and excessive heat buildup, which can lead to tire failure. The only way to correctly measure the inflation pressure in your tires is with a quality inflation pressure gauge. Using your boot, a billie club or a hammer is not accurate, and never depend on your eyes to check tire inflation. There can be as much as 20 PSI difference between tires that look the same to your eye. You need to invest in an accurate inflation pressure gauge. You should get one with a double, angled foot. This makes it much easier to check the outer tire of a dual set. Check all of your tires on a regular basis and adjust the pressure according to the manufacturer’s recommendation. Never check inflation pressure when the tires are hot. You’ll get a higher-pressure reading and if you let some air out they will be under inflated when they are cold. If you have dual wheels you’ll want to add extension hoses to the valve stems to make the job of checking tire inflation easier. It can be nearly impossible to check the inner dual without extension hoses. The best extension hoses will have stainless steel reinforcement and external braiding for long trouble-free life. Ozone in the air and UV rays from the sun shorten the life of your tires. It’s not uncommon to see RV tires with low mileage and plenty of tread that are ruined by the damaging effects of ozone and UV rays. Ozone in the air causes tires to dry rot and deteriorate. UV rays from the sun make it happen quicker. This is especially true of the tires sidewall. Inspect your tires for checking or cracks in the sidewalls. If you notice any damage to the tires have them inspected by a professional. Keep the tires covered with covers that will block out the sunlight when you’re not using your RV. You should also place something like a piece of wood between the ground and the tires. Be sure that whatever you use is larger than the footprint of the tire. No portion of the tire should hang over the edge of the tire block. This can cause internal damage to the tire. Occasionally washing your tires with soap and water is OK using a soft brush. Sidewall rubber contains antioxidants and anti-ozones that are designed to work their way to the surface of the rubber to protect it. Washing tires or scrubbing excessively removes these protective compounds and can age tires prematurely. The same is true of most tire dressings. Products that contain petroleum, alcohol or silicone are bad for tires. guarantees, but by practicing good tire maintenance you can feel much safer and secure that the weakest link on your RV will do its job while you’re out exploring this wonderful country we live in.